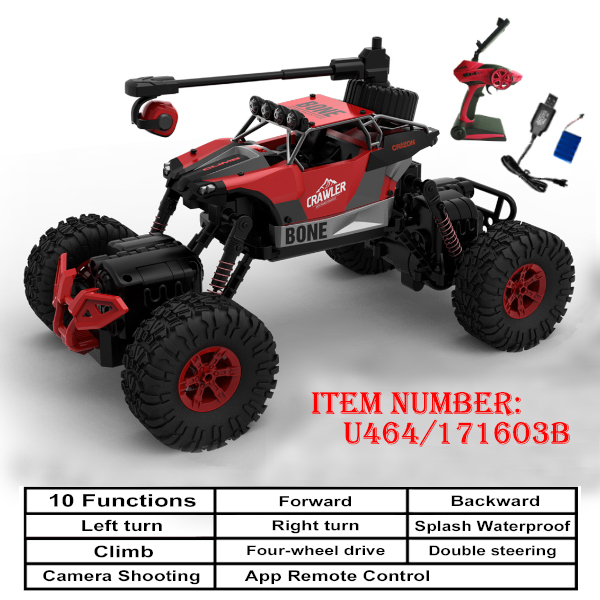 Detail information: *** 1:16 2.4G Double Steering Climbing Car (with 0.3MP camera & WiFi FPV); *** Speed: about 15km/h; *** For Car: 1 x 6V 600mAh Rechargeable Battery Pack, by charging USB Cable (included); *** For Remote Controller: 4 x 1.5V AA battery(not included); *** Charging Time: about 3 hours, *** Playing Time: About 15 mins; *** Remote Control Distance: about 30-35M; *** Car Size: 30.5 x 19 x 19 cm. *** Functions: 1. Control by transmitter or mobile phone (but for camera must be controlled by mobile phone) with 0.3MP (640*480) Camera, increased mobile phone remote control function; 2. 4WD & Double Steering Climbing Force: can climb 50 degree slope; 3. Splash waterproof Vehicle life waterproof design, even in places where there is mud can play, allowing players to experience the true cross-country fun, after play can rinse clean via water. *** Carton Size: 66 x 40 x 88 cm / 0.23cbm(8.21cuft). *** 1 x 40'HQ = 2,344 pieces (293 cartons).